In case you weren't aware, February is Black History Month. I've actually spent a fair amount of time over the past several weeks trying to work on at least one blog post that acknowledges it with something more than a passing mention, and I had a lot of trouble landing on anything meaningful. For some reason, I kept going back to George Herriman and how, despite his African-American heritage, was light-skinned enough to pass as a white man. Which he did throughout his entire adult life. And art scholars more credible than myself have analyzed Krazy Kat to death, trying to pull out clues of Herriman's thoughts on race, since he never spoke of it publicly. But I'm not nearly educated enough about Herriman to really say anything of significance. Indeed, after reading this article from last year, I'm certain that I'm really not qualified to make any judgments on Herriman's racial background. But the S.O. pointed me the other day to a fairly new webcomic called The Princess. It's by Christine Smith and is a spin-off of Eve's Apple (which I'll admit I've never read). The Princess is about a young boy named Seth, who prefers to think of himself as a girl. He likes to wear dresses and prefers to be called Princess Sarah. It's still early enough on in the strip that I don't know if I like it or not, but I'm certainly intrigued by the thematic notion of defining one's identity. The reason this intrigues me is because I've never really identified myself with respect to any particular group. I don't think of myself as an American, or as a graphic designer, or as a Gen X-er, or as an atheist, or as anything other than Sean Kleefeld. I am me. Period. While I am a member of all those groups, and many more, I don't use them to define who I am. I am an individual, with individual thoughts and preferences which may or may not coincide with other's. I'm able to choose who I am, and how others see me. In my last band, our bass player claimed that he was very good at reading people. That he was able to get a good sense of who they were fairly quickly, and direct his words and actions to steer them in the direction he wanted. I had him flummoxed, though. He was never able to figure me out, and I unintentionally kept him on his toes. Which pointed me to the realization that he didn't read people, so much as he understood broad categories of people. "Oh, you listen to NPR, so you must think X, Y and Z." "Oh, you've got a dog, so that must mean A, B and C." But because I didn't really fit into those neat categories -- I never took up those mantles of identification and adopt other ideas of the group as a whole -- he had no model to predict my behavior. Admittedly, I have the privilege of being able to do that. I recognized even as a teenager that I was a white male in a society that allows white males to define themselves. I relayed the story a few years ago about how a black family moved into my hometown when I was a kid. The son who joined my class was immediately seen as "the black kid" and was treated according to the broad racial stereotypes of the time. It was matter-of-factly assumed he knew how to breakdance, for example, and was asked to do so for some school function. (While he did know a bit, there were some white kids in our school who were FAR better at. I distinctly recall my mother commenting on exactly that at the time.) He had less ability to define his own identity because others were placing one on him. To this day, I don't know if he began living down to that identity ("down" because it really wasn't very flattering for anyone) or if it was deserved because of whatever other issues he may have had going on; I suspect some of both as I reflect back on it. But the point brought up in The Princess, whether it continues to be entertaining or not, is the discrepancy between how we identify ourselves versus how others identify us. The example strip I showed above speaks directly to that point. The mother recognizes the difficulty in dealing with a society that is quick to put labels on people, and doesn't wish her son to go through any more hardships because of that. The father, by contrast, seems to have the understanding that you can't deny who you fundamentally are and trying to do so will simply bring about more internal conflicts. Which, as we all know, are infinitely more difficult to deal with than external ones. Keith Pollard was a favorite artist of mine back in the day, primarily because of his work on Fantastic Four and Amazing Spider-Man. That he was black was irrelevant. More to the point, that he had a race at all was irrelevant. It was years before I gave any real consideration to what he might look like, and when I did, it was only because I happened across a picture of him by accident. I've only met him once, but he seemed like a genuinely nice guy and still does a bang-up job on his comics projects. Consequently, I identified Pollard as a "talent comic artist." Now, whether he identifies himself as such is another matter. He might well ascribe other attributes to himself more readily. "Husband" and "father" spring to mind as distinct possibilities. But that's up to him. That's how he chooses to identify himself, and how he's going to present himself to others. Indeed, the brief time I met him, I wound up talking more with his wife while their son was running off to get sodas for the three of them. And that's the interesting twist here. Even though I've spent decades thinking of Pollard as a "talented comic artist", he was able to change the identity I had ascribed to him in a matter of minutes. By having his family with him at that particular convention, by their being able and willing to engage with his fans, his identity of "husband" and "father" becomes more prominent. Regardless of how deliberate that decision was on his part to affect my perception of his identity, he actively changed how I identify him. The "talent comic artist" label was appropriate insomuch as that was all the information I had with which to identify him. Once I saw his photo, I could potentially have changed that to "talented black comic artist." But that was only because I only had those four pieces of information about him. In meeting him, he was able to present himself as HE self-identified; he was able to show others what labels he felt were more important to him. He was true to who he was, and discarded any identities that weren't relevant. That's not to say that simply presenting yourself as you self-identify is the ultimate answer and will immediately bring everyone around to that same thinking. The Princess highlights that's definitely not the case, at least some of the time. But if you don't embrace who you feel you are -- if you let others ascribe identities to you -- you're going to have problems. The great people who are celebrated during Black History month are/were undoubtedly worth celebrating. Some of them, like Frederick Douglass, Martin Luther King Jr. and Malcolm X, are strongly identified with the black experience. Others, like George Washington Carver and Paul Laurence Dunbar, are more readily identified for their achievements alone. We celebrate Black History Month not for the sake of honoring those who've worked FOR African-Americans, but for the sake of honoring good works who've been historically sidelined by 'maintsream' outlets. These aren't people who necessarily identified themselves AS black -- Herriman being a prime example of someone who actively rejected that identity -- but people who just did a damn fine job and ought to be given the respect they might not otherwise get because others have forced identities onto them. 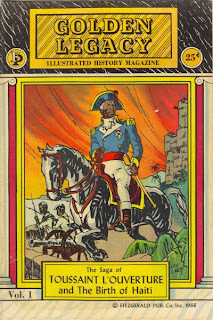 So here's to George Herriman, Keith Pollard, Jackie Ormes, Bertram A. Fitzgerald, Joan Bacchus Maynard, Ron Wilson, Dwayne McDuffie, Christopher Priest, Aaron McGruder, Keith Knight, Charlie Trotman and the hundreds of other African-American comic creators whose work I've enjoyed over the years. My thanks most likely aren't shown nearly enough. Great post. I used to joke and say that I would call myself a nihilist except for that I did not believe in labels. "A man should not be judged by his clothes, but by the company he keeps." I have to confess I was somewhat surprised when I met Pollard at MidOhioCon. But, of course, so much of American comics is "white guy with beard and/or glasses." I assume that's changed slightly, at least, compared with what it used to be; even so it's still true a lot of the time. 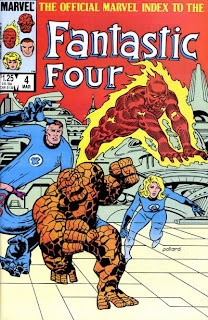 But Pollard was drawing a flagship book, The Fantastic Four, back in the 1970s. Maybe things have changed less than I thought; hopefully there is still growth in diversity continuing to take place. I think more variety of perspectives going into comics is good for everyone.